This is a page from the British Journal of Photography for 1 August 1861. It records a journey to Orkney in 1860 by a photographer called John Traill. He must have had some connection with the Traill family in Kirkwall but from his comments, he had probably not been there before. What is fascinating is that he had a stereo camera and a 12" x 10" plate camera! What ever happened to the pictures? I can now add to this information. This is in fact John Traill Taylor (1827-1895) who became editor of the British Journal of Photography shortly after publishing this article. He was a founding member of the Edinburgh Photographic Society in 1861. Thanks Dr Rock for posting this so legibly; it's well worth reading in full. Had I been asked when the idiom 'the morning saw us (doing so-and-so)' came into popular English usage I'd have guessed within my own lifetime. 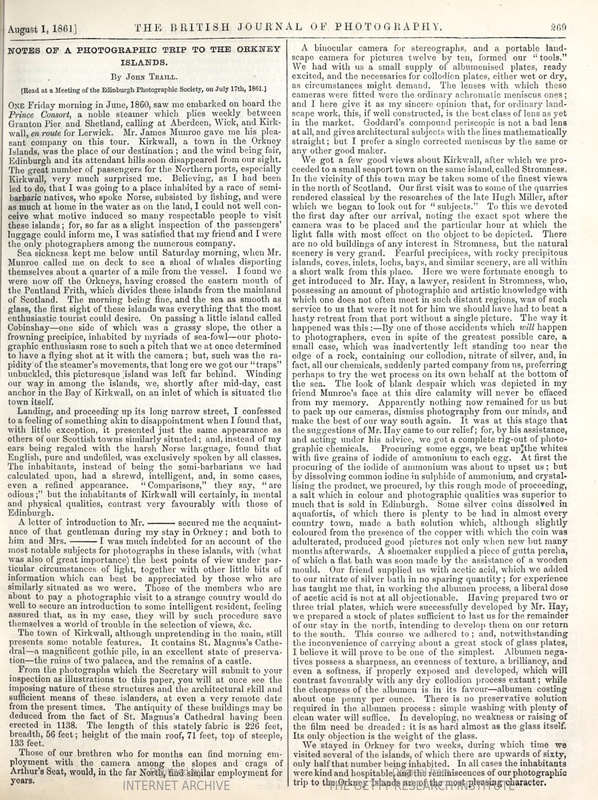 And here it is kicking-off an article from the mid 19th century! But much more interesting would be the answer to Dr Rock's final question. According to 'Scottish Studio Photographers to 1914, Vol. 2, (Scottish Record Society 2011) John Traill was, in 1871, a Photographer's apprentice, aged 14, born in Liberton and resident at 11 Tower Street, Duddingston with his parents John and Christina. The 1901 Census records a John Traill as a Photograph Canvasser, aged 44, and born in Johnshaven, a boarder at Burns Home Lodging House, Dundee. I am not sure if this is one and the same person! Just realized that this John was in Orkney when the previously mentioned John was only 4 so might this be his father? Further research required.